Today's post is ALL ABOUT FRINGE. 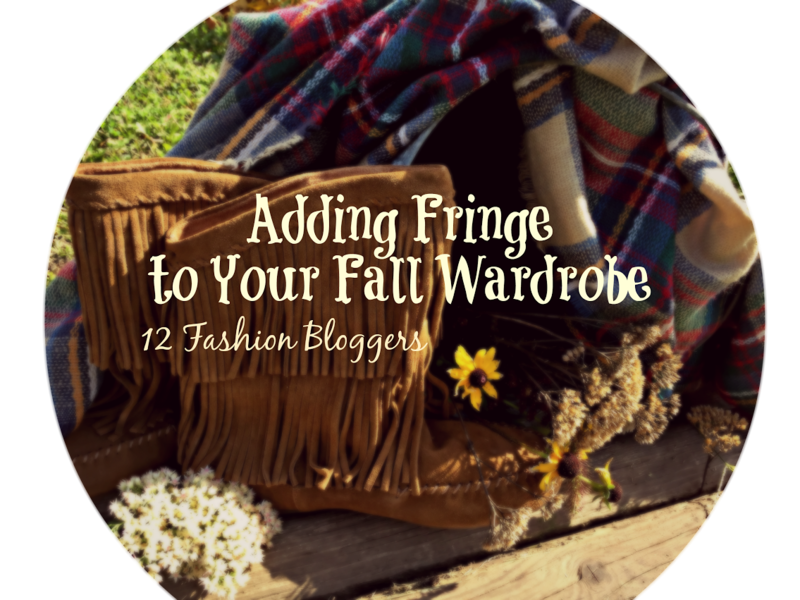 I've teamed up with 13 other bloggers to give fashion tips for adding fringe to your fall wardrobe! Fringe is a big trend this fall and is EVERYWHERE from shoes to purses to clothing to jewelry. This Open Fringe Cardigan was a great find at Target and a "steal of a deal" at only $11.18 (yes, you read it right!)!! I love the geometric pattern and of course, the fringe. It's super comfy and drapes nicely over a short sleeve shirt or long sleeve shirt like I've styled here. This sweater is the perfect fringe item to add to your wardrobe and the price makes it that much better! It pairs well with skinny jeans and would look cute with black jeans or leggings. I've never been one to spend a lot on jeans, but lately I have realized that the wardrobe items I get the most wear out of are jeans, so why not invest in a better pair?! I finally found these AG skinny jeans at Nordstrom Rack at an amazing price and they are SO SOFT. If you're looking for a similar pair, check out Nordstrom Rack for major discounts (no need to pay full price!). I added a little more fringe to the look with these Jessica Simpson taupe fringe ankle boots. They are my new favorite booties for this fall and winter! I found them at Marshall's so they aren't online, but there are two very similar versions at Nordstrom (splurge) and Sears (save). By the way, my red sunglasses are 50% off with code FALL50, my Alex and Ani Dog Bangle (looks just like Jax!) is 50% off, and a similar necklace, the Kendra Scott Rayne Necklace in Turquoise is 25% off on Amazon! Be sure to check out (and get inspired!) how these ladies styled fringe, too! Love everything! What a steal on that poncho. BUT THE BOOTS. I really want to get some fringe booties. Cute look! Ahhh I know, the boots! I found them a few weeks ago at Marshall's in Royersford...they may still have them! Holy good deal! What a great cardigan! It's so much fun and looks so cozy! The blotted are so fab too! LOVE that cardigan, I am loving geometric prints right now so this is perfect! Those booties are fabulous and you look great in that poncho/cardigan!! Just found your blog. Love it and your style! Got lots of ideas for things I have and things I *need*. Aaaaaand.... Is that an Airedale puppy I spied in some of those pics? Hi Christa! So glad you stopped by blog! Thanks for the nice feedback! My pup is actually a Welsh Terrier. He is 2 yrs old. Welshies look exactly like Airedales, just smaller! ok seriously under 12 dollars?!!! I can't! Looks amazing on you...love the whole look. That cardi is killer and so are the booties for that matter!